The Astros are back and look hungrier than ever. 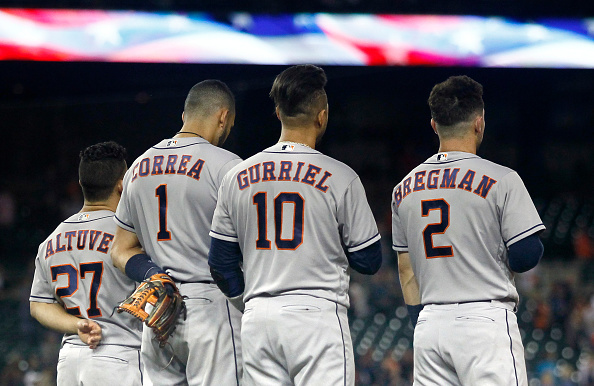 How will the 2019 season turn out for Houston? Can they take the crown back? Its that time of year once again ladies and gentlemen. Major League Baseball is back. The usual suspect’s people predict to do well are also back. That includes the Houston Astros. Now two years removed from being champions, what’s the goal? The answer, of course, is to take the title back. However, it won’t be easy. Typically in baseball, nothing is easy. In fact, it is rare to see back-to-back champs. The last team to win consecutive titles was the New York Yankees. Their squads from 1998-2000 won three straight. Remarkable indeed. Times have changed though. Unfortunately, the Astros couldn’t find the magic from 2017 in 2018. In disappointing fashion, the “Stros were knocked out by the eventual champions. In the ALCS, the Boston Red Sox really took it to them and in 5 games, the dream of repeating was over. Now it is Spring 2019 and here they are again. The Astros aren’t going anywhere. This isn’t like a decade ago when Houston lost in the World Series in 2005, only to sink into mediocrity for the next eight years. You heard that right. The Astros wouldn’t be in the postseason again until 2015. And believe me, fans were so happy when the boys in orange finally broke through in Los Angeles two Octobers ago. Let’s live some of the best moments of that series against the L.A. Dodgers one more time. Game 5 of the 2017 World Series is by far among the best in MLB postseason history. I still can hear Joe Buck announcing this game. Who can forget when George Springer launched a game-tying homer off of Brandon Morrow to tie the game at eight all? The ball literally exploded on the train tracks people. It doesn’t get better than that. The game was insane from the bottom of the seventh inning on. My personal favorite part of the broadcast of that game was the bottom of the 10th inning. Alex Bregman hit the ball into center field to bring on Derek Fisher and then Joe Buck said it best. “ASTROS WIN!!! IN 10!!! !” However, nothing beats the next clip. Let me explain what that meant for a second. As longtime Astros fans know, it was a difficult road to get to this point. A lot of tanking for starters. It took multiple seasons of over 100 losses to land some of the names we love now. Springer, Carlos Correa, Jose Altuve, etc. Then it took a genius trade deadline by GM Jeff Lunhow to land Justin Verlander. Just some of the important names that led to that title run. Many of them were back last season also. This time around, the roster is mostly intact with some notable changes. Let’s list some of the guys that have departed who played big roles. This one stings a bit. In the end, everyone must understand that sports are a business. However, the loss of Keuchel might sting a bit. The guy was a Cy Young winner here in H-town and was the guy on the pitching staff for the Astros before Verlander came. There were times where he was inconsistent. But boy when he had his curveball and slider working, it was magic. Unfortunately, he is still a free agent at the start of the season. But, he knows one thing. The Astros would gladly bring him back to a rotation that already has depth. Never hurts to have insurance. Now this one really hurts. McCullers Jr is an extremely talented pitcher. Easily the number two guy on the rotation here in Houston. Now the 2019 season is gone due to Tommy John Surgery. The injury started as discomfort in his pitching elbow last August. Now he’s done for this year. While his absence will be felt, Houston has assembled some depth that it might just work. The key for McCullers Jr. right now is to recover and come back strong next year. Morton had some excellent moments for Houston, especially in the postseason. A versatile pitcher, he could start and go six innings, or come in and relieve a game. Hell, he could even close if necessary. Another pitcher who could throw some heat, and mix it in with a decent curveball, and a nasty slider when he had a good day. Unfortunately, the team decided not to give him a qualifying offer this off-season. His two years in an Astros uniform were great. Posting a record of 14-7 with a 3.62 ERA in 2017. Then bested that mark with a 15-3 record alongside an ERA of 3.13 in 2018. By far his best season as Major League pitcher. Now a member of the Tampa Bay Rays, Morton will see his old squad on Opening Day in Tampa. Thank you for those two seasons, Charlie. Best of luck in your career. Finally, out of the bunch, Marwin Gonzalez. This guy was an opposing manager’s nightmare for reasons not really talked about. For starters, the guy is a class utility man. He can play any position in the infield when needed. He’s a decent bat in the bottom of a lineup, and the man is a beast defensively. Especially when put at first or third base. He has a cannon of an arm, and he rarely makes mistakes. The man only has 32 errors in his career. How many of those came at first base? Six. Count em, six errors at first base in seven seasons. Remarkable. The Minnesota Twins got an overall class act for their team. We’ll miss you down here, Marwin. Alright, alright. Enough lamenting. Those are some big departures. However, this is still a stacked squad. And did I mention that great GM of ours, Mr. Lunhow? Yeah, have no fear. He brought in some nice pieces as well. Let’s take a look, shall we? Okay, let’s be honest. As much as Brian McCann helped with his veteran leadership, he was more of a liability last season. Now there is a different face who will catch pitches this year. Enter, Robinson Chirinos. The only reason this is an upgrade is because of McCann’s injury history. There were times it was painful watching McCann catch a game coming off an injury. Chirinos’s batting averages are slightly higher and more efficient than McCann, and he’s about as good defensively. And he also won’t struggle to throw runners out. One of McCann’s weaknesses as a catch was his inability to stop base runners on a steal attempt. Another area of weakness last season taken care of. Michael Brantley is a great pick up. Here’s a guy who can give you 18 to 20 homers a year, 80-90 RBI’s and provide a decent defensive presence in left field. Most importantly, he takes pressure off of guys like Springer and Reddick on offense. The guy is a career .295 hitter and came off a season where he hit .309, with 17 home runs, and 76 runs batted in. A welcome addition indeed. At the end of the day, this Astros team is very dangerous. Possibly even more dangerous than the squad that won it all in 2017. Here are some examples of their depth. Bullpen: Colin McHugh, Brad Peacock, Hector Rondon, Ryan Pressly, Will Harris, and Chris Devenski. With depth like this, the Astros will look to be a headache once again. If for one-second teams don’t believe it, well they are dead wrong. The Astros remember how they went out last season. Something tells me this year will be a little different. Expect around 103 wins again for this team. AL West Division champs again. This time they will return to the ALCS, probably against New York or Boston. They’ll win the ALCS in six games, advance to the World Series, where they will win it all in six games as well. Yup, you heard it here first. They’ll likely face off against the Dodgers again in a World Series matchup, and I like their odds against L.A. While no title run is easy, especially these days, The Astros are no slackers. In fact, quite the opposite. Nonetheless, get excited Astros fans. It’s time to take it back and bring it back to Houston. It is truly a remarkable time to be a Houston sports fan. More importantly, what a time to be an Astros fan. Indeed, let’s get excited. Good luck to the boys in orange this season. Make Houston proud! Meanwhile, to stay up to date on all things Astros, or Houston for that matter, stay tuned to NGSC Sports. We’ll be here to give you the latest all season long.